Predators is directed by Nimród Antal but carries the mark of Robert Rodriguez like an old tattoo that no amount of violent scrubbing will ever erase. This is presumably because people associate Rodriguez with big, balls-out, machismo, action of the Once Upon A Time In Mexico and From Dusk Till Dawn variety which Predators very much aspires to and which, therefore, the marketing people are happy for you to associate it with. What one should also associate Rodriguez with though is the Quentin Tarantino School of 'if it's cool, throw it at the screen' with which he is indelibly linked. Predators definitely bears both of these hallmarks but perhaps through either Antal's restrained direction or Alex Litvak and Michael Finch's 'going nowhere fast' script, Predators features neither of the aforementioned facets in big enough quantities to make it entertaining. The real problem is the basic as hell story, which feels like an excuse for the production team (yes, including Rodriguez) to throw as much fanboy paraphernalia at the screen as possible. 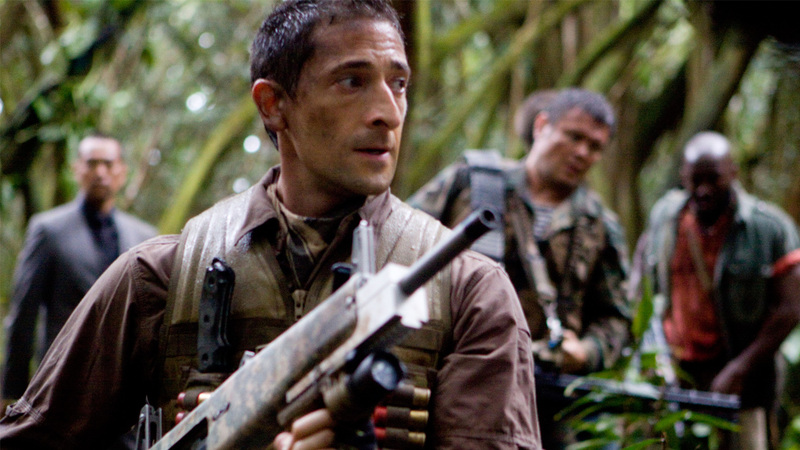 Royce (Adrien Brody) and the band of misfits that get dropped on to the Predator's hunting planet stumble around with little to do until the arrival of Noland (Laurence Fishburne) gives them a loose purpose in life which, even then, seems to alter their actions to a very small degree. The Noland character has been the subject of much debate and so, to put the record straight: yes he does feel like he's wandered in from a different film but equally, he is entirely needed because before his arrival and conveniently transparent exposition the film finds itself in danger of grinding to a shudderingly boring halt. The cast of characters included for the Predators to pick off includes the coolest of the cool from a selection of available bad-men (and women) stereotypes; a sniper (Alice Braga), a drug cartel enforcer (Danny Trejo), a Yakuza (Louis Ozawa Changchien) and a death row inmate (Walton Goggins) all feature but Antal's treatment of them is endemic of the film's problems. Braga's character gets a few moments to shine but the rest - perhaps through over-saturation - get scant little to feed on and when they do finally get their moment the scenes are often under-directed and much less thrilling than they should be: particularly in the case of Changchien's scene which should be much more beautiful than it actually is. Like a Predator who's had a bit too much Christmas tipple, the film lurches towards a sticky, self-induced end which feels more 1950s creature-feature than it does 2010 space age thriller. There's little real joy to be had from it, especially the final few frames which only confirm what we already knew about the directionless script. Surprisingly, Brody provides one of the few highlights as a marine who's learnt his speech inflections from Bale's Batman but other positive points are difficult to extricate from a film which should offer huge amounts of fun but instead offers huge amounts of nothing. I liked this movie quite a bit. The wandering in the first half of the film was fun in how it reminded me of the similar wandering from the original 'Predator' film. Not as good, but similar. I'm just a sucker for these cheesy films. I agree that there was some simple joy in watching the band form together and the world become established but I found there was just too much aimless wandering with limited tension for my tastes. Glad you enjoyed it though!